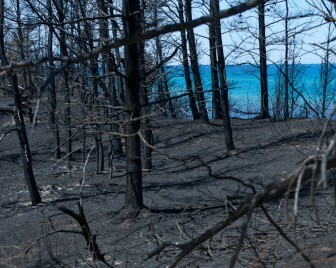 Two years after the Duck Lake fire swept through 21,000 acres in the Upper Peninsula, experts this spring will assess the need for new plantings to restore the primarily jack pine forest. Forest managers will search for areas where a 2013 drought led to failed recovery plantings. In the slider’s 1983 image on the left, you can see where dense forest has been replaced by open areas visible in the 2013 image on the right. But this year is wetter and recovery is on track, foresters say. 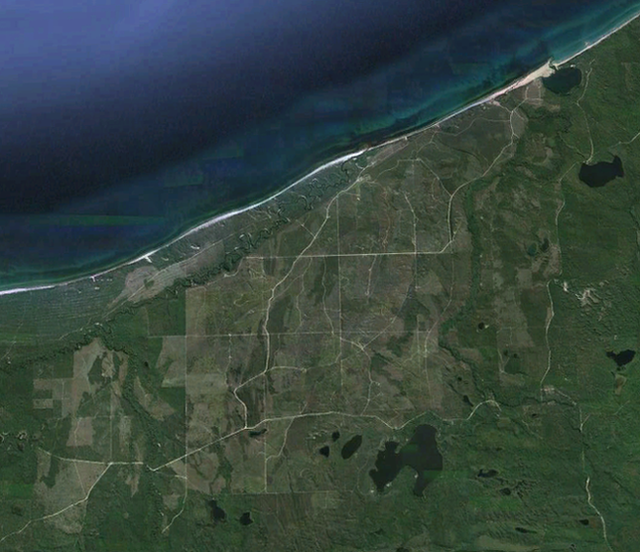 Michigan’s Upper Peninsula is no stranger to wildfire. While common, state forest managers, who protect the forested landscape, generally keep wildfires contained within 10 acres to avoid private property loss. But some get out of hand. 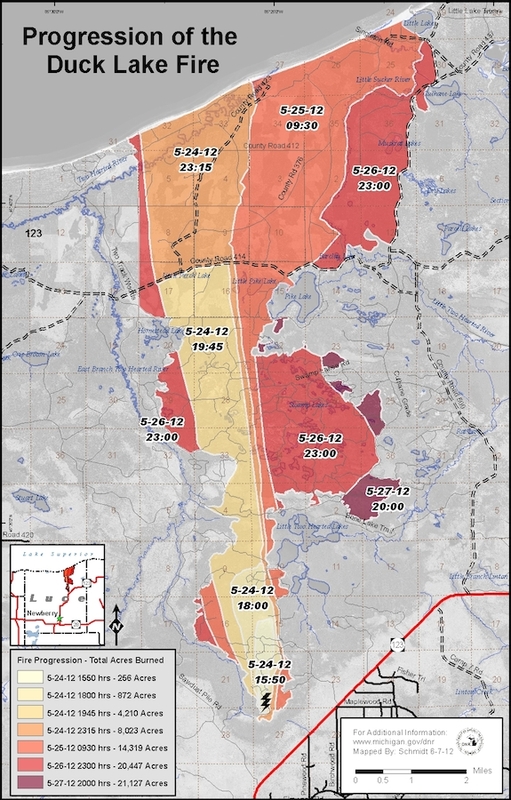 In Michigan, the Seney fire east of Marquette, burned 73,300 acres in 1976. 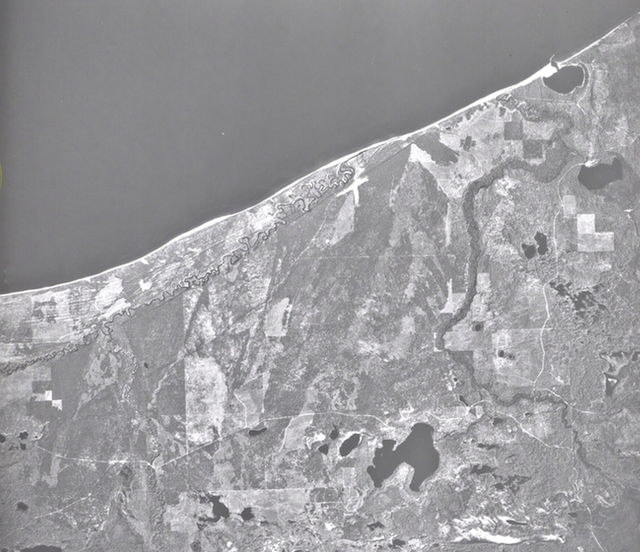 The Mack Lake fire in southern Oscoda County burned 20,000 acres in 1980. And the more recent Duck Lake fire became the third-largest wildfire in Michigan’s last 100 years, charring 21,000 acres near the Luce County shoreline. While the fire affected both people and natural environments, the northern jack pine forest took the greatest loss in 2012. The drastic change in the landscape as a result of the Duck Lake fire is neither new nor of great concern to forest management experts. This time, a mix of drought and lightning sparked the fire, which was pushed north by heavy winds along the Lake Superior shoreline. And the forest provided great fuel. “Jack pine evolved to burn,” said Keith Magnusson, Newberry unit manager for the Forest Resources Division. In fact, the jack pine can only reproduce when intense heat causes their cones to open. “Pines produce serrotonous cones, which in most cases require the heat of a forest fire to allow the seeds to disperse and germinate,” said Marvin Roberson, forest policy specialist with the Michigan chapter of the Sierra Club. Before the Upper Peninsula became a patchwork of timber management and recreational housing, jack pine tended to burn on average about every 40-years, he said. Forest managers suppress the natural burn cycle to protect property and the timber that is sold commercially. Those are the same fires that would normally help trees reproduce. So they attempt to mimic nature by carefully controlling burns and using other measures. They use a process called scarification, where they “drag chains, turning up the soil, eventually allowing the cones to open and the seeds to spread,” said Magnusson. The artificial process has allowed the once charred, black moonscape to regenerate. Green replaces black as grasses, sedges and jack pine cover much of the ground with one-inch to one-foot of growth. While expected, the recovered growth prompts a series of management questions, said Magnusson, who will assist in the 10,000-acre assessment of the regeneration this spring. Forest managers, like Magnusson, continue to question the number of pines needed to both supplement growth and provide timber for wood products. As with any fire, managers salvaged burned wood after the Duck Lake fire, racing against time as insects quickly inhabited the blackened trees. Affected areas that were previously cut for timber were replaced with new plantings, Magnusson said. “But critics discouraged the salvage, defending the local benefits to wildlife,” said Paul Kollmeyer, resource protection manager within the DNR’s Forest Resources Division. Dead trees offer both a preferred nesting habitat and food source for a number of species, including the Kirkland warbler, said Roberson. Some sections were set aside. For example, no wood was salvaged from ecological reference areas, nor along river-corridors, lakes and ponds, said Magnusson. Ecological reference areas are those dedicated to natural processes. Little to no management occurs on these sites, letting nature do its own work. Wildfires tend to reopen forest management discussion, but the Duck Lake area, which contains heavily managed timber, continues to provide wildlife and recreation value, said Magnusson. “Ecologically the Duck Lake fire was a good thing, a natural thing. Whether we wanted it to happen is a whole separate question. It certainly changes the landscape,” said Roberson.